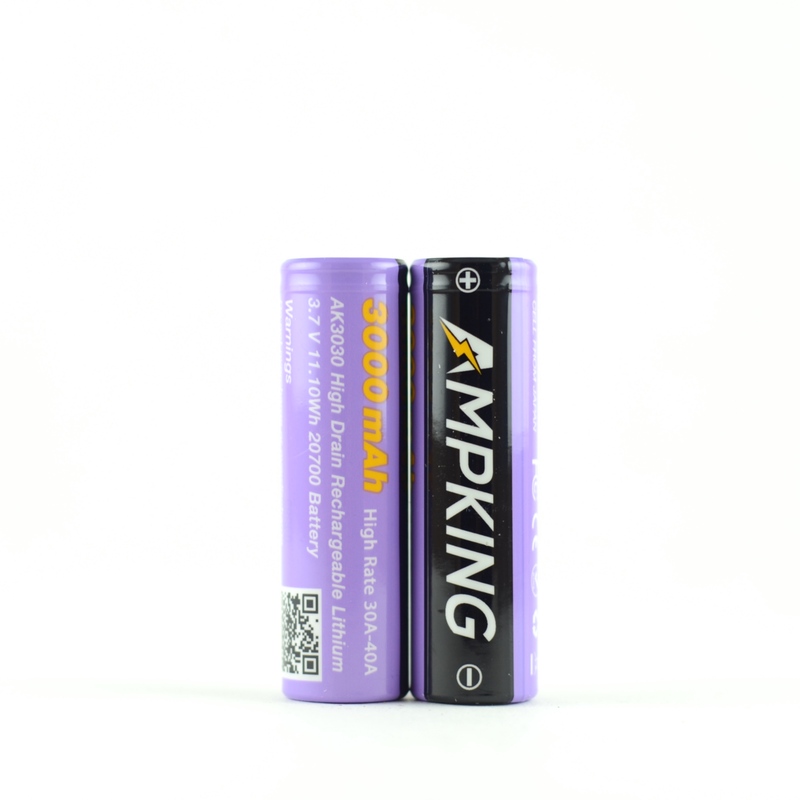 Ampking AK3030 - 20700 Battery 40A - 3000mah Ampking AK3030 20700 Rechargeable Battery comes with 3000mAh battery capacity with 40A max discharging current. Ampking AK3030 20700 Rechargeable Battery comes with 3000mAh battery capacity with 40A max discharging current. Ampking AK3030 20700 Rechargeable Battery comes with 3000mAh battery capacity with 40A max discharging current. It can be used with most 20700 regulated and mechanical MODs. Long storage life, light weight and high energy density. Get it as a spare part. WARNING: RTV products and accessories are only intended for committed smokers, vapers of legal smoking age and not by non-smokers, children, women who are pregnant or may become pregnant or any person with an elevated risk of, or preexisting condition of, any medical condition which includes, but is not limited to, heart disease, diabetes, high blood pressure or asthma. If you experience any side effects or possible side effects, stop using the product immediately and consult a physician. E-Liquid contains nicotine, a poisonous and addictive substance. E-Liquid may be poisonous if orally ingested. E-Cigarettes and vape/vaping products are not a smoking cessation product and has not been tested or guaranteed as such. E-Cigarettes have not been evaluated by the Food and Drug Administration nor is it intended to treat, prevent or cure any disease or condition. For their protection, please keep out of reach of children and pets. Copyright Rocky Top Vapor LLC. All Rights Reserved. eCommerce Software by 3dcart. Theme by TangoPixel.